Keep your cool when your boss bullies you. Working with a boss who bullies employees can destroy morale, hamper productivity and make you dread coming to work each day. 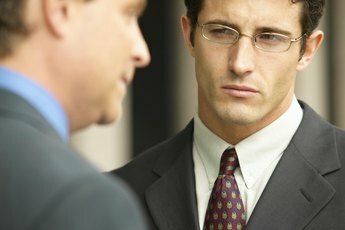 If you work for a bullying boss, it’s crucial that you keep your cool and try not to let your emotions get the better of you, no matter how hurtful your boss’s words or actions are. Take the high road. No matter how poorly your boss treats you, don’t ever resort to the same kind of behavior he uses. Stay calm and strive for professionalism in all of your dealings with him, and don’t yell at him, call him names or lose your temper at the office. Follow your company’s policies and procedures for reporting inappropriate workplace behavior or harassment, which might require you to a file a formal complaint with the human resources department or with your supervisor’s superior. Observe his behavior. While some bosses seem to “go off” for no apparent reason, there’s often a pattern to a supervisor’s bad moods. It may be that he’s cranky after a meeting with his own boss and takes it out on his employees, or he may be more likely to snap first thing in the morning or late in the day. Pay attention to when he’s more likely to bully and what seems to set him off, so you can keep your distance during those times. Have a plan. 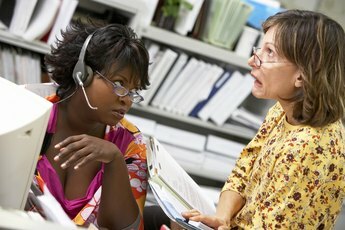 In the “Psychology Today” article “How to Deal With a Difficult or Bullying Boss,” Ronald E. Riggio, Ph.D., recommends anticipating your supervisor’s bad moods and creating a plan to cope with them. Prepare your responses beforehand, Riggio suggests, and write them on index cards. Practice delivering the responses, which may include statements such as “When you criticize us, it makes us feel you don’t value our work.” Try to anticipate what your boss might say in response, and prepare replies for that as well. Find supporters. When you work for a boss who constantly demeans you, you may begin to believe he’s right that you’re not good enough or smart enough. 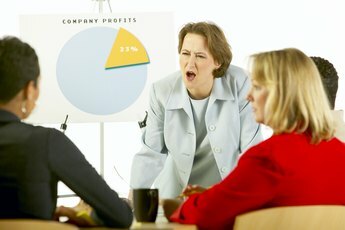 In the “Fortune” article “Horrible Bosses: When Your Boss Is a Bully,” Gary Namie of the Workplace Bullying Institute recommends enlisting a trusted friend or colleagues to give you a “reality check.” This ally can let you know when your boss has a valid criticism and when she’s just trying to tear you down. Distance yourself. Sometimes, the best way to deal with a bully is to stay away from her whenever possible. In the ABC News article “Got a Bully for a Boss? How You Can Survive a Toxic Workplace,” executive Tory Johnson recommends standing up for yourself by walking away when your boss starts bullying you. “Bullies only scream at people they perceive to be weak – those who’ll easily take it,” advises Johnson, the CEO of Women for Hire. By refusing to participate in your supervisor’s tirades, you show her you won’t accept that kind of behavior. Why Do People Bully Me in the Workplace?